Fort Collins is home to Colorado State University’s Animal Cancer Center, one of the best canine cancer care clinics and research facilities in the world. Athena’s primary care vet is one of the leading animal pain management specialists, Dr. Robin Downing, in Windsor, Colorado. This lucky Dane is also fortunate enough to participate in CSU’s Gene Therapy Clinical Trial (gene therapy uses specific genes that are carried into cells to fight cancer). I was just wondering how Athena is doing? I have a Great Dane who just turned 3 that has a tumor in her front leg. We getting a biopsy in two days. Please help me! We are devasted! Thanks for asking Heather, unfortunately Athena passed away after loving life on three legs for over a year. Be sure to check out Nova’s blog, she is a blind three legged Great Dane who has beaten the cancer odds for nearly two years! You’ll find much more support and inspawration in the discussion forums. Best wishes to you and your pup. 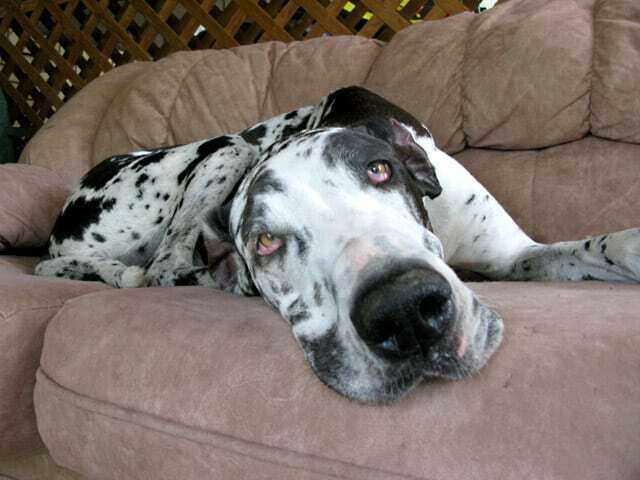 I also have a great dane who has also been diagnosed with the same bone cancer and we are at the time of deciding whether we should amputate or not as we are a little unsure as have a big stair case that she would have to tackle to go out side so was wondering if you are still happy with your decision and how your dane is now going?